The landslide took place at around 11 am on Friday, 2 May, in the Nowabad area of Aab-Baarik in Argo district of Badakhshan province. Initial reports estimated that the entire area comprising three villages had been submerged in the mud, with an estimated loss of life of over two thousand people. But it has now been established that only one of the villages was destroyed, though hundreds of families in the other villages and from a wider area have had to be relocated for fear that they will be affected by further mudslides. The final death toll has not yet been announced but hundreds are believed to have died in the initial disaster, including many villagers who had gone to help. Sulaiman Sarwary, Afghanaid’s Deputy Director of Programmes, was in Abi Barak after the landslide and saw the devastation at first hand. He described it as 'beyond comprehension'. He was also told harrowing stories of entire families being buried in the mud. ‘One woman lost her seven sons when they came to try to find her. The tragedy was made much worse because after the first landslide, many local people arrived to try to help and were themselves killed in a second landslide’. Afghanaid has been working for many years in Argo district as the facilitating partner for the NSP (National Solidarity Programme). Our staff know the affected villages well and have been on the front line helping to alleviate the suffering. 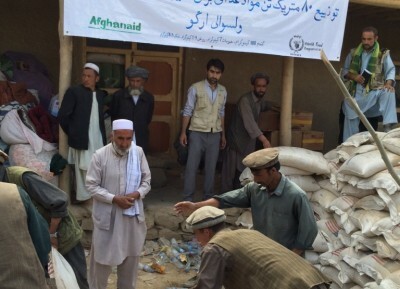 On the day of the landslide, Afghanaid’s MD, Charles Davy, sanctioned US$1000 immediately for relief which was used to distribute some food and milk and water, which was much appreciated by the local people. Over the weekend, the World Food Programme, under our local agreement with them, released 80 metric tonnes of foodstuffs for the stranded families which was distributed to the distressed families on Sunday and Monday. Food distribution was held up initially for security reasons but went ahead without incident on Sunday. A number of countries have donated food for the survivors and there is now no shortage. The Government is setting up a rationing system to ensure fair distribution to those in need. Afghanaid is conducting an assessment of longer term needs. Other NGOs have set up health clinics. But clean water remains a priority. The rehousing of those who have lost their homes will take time and considerable resources. The tragedy has attracted a great deal of political interest and sympathy, with the two leading presidential candidates, Abdullah Abdullah and Ashraf Ghani visiting the scene on Sunday. The landslide is the result of widespread flooding in the north of the country, focussed principally in Jowzjan and Sar-e-Pul, but also affecting Badakhshan and a wider range of provinces. The United Nations estimate that 71,000 people have been affected so far by the floods, which have caused 159 confirmed deaths in addition to those lost in the landslide. Mark Bowden, the UN Humanitarian Coordinator, has said that this year is proving the worst for loss of life in humanitarian disasters for ten years and has pointed up the importance of preventive measures.